Delivery of gRNAs for fly CRISPR/Cas genome engineering is most commonly done by either DNA or RNA injection or by creating transgenic gRNA lines. Plasmids for both DNA injection and gRNA transgenes use polymerase III dependent U6 promoters to transcribe gRNA. Currently all published CRISPR/Cas systems for Drosophila use the U6-2 promoter to drive gRNA expression in the fly embryo. However, the Drosophila genome encodes three U6 genes, U6-1, U6-2 and U6-3 (also known as snRNA:U6:96Aa, snRNA:U6:96Ab and snRNA:U6:96Ac). 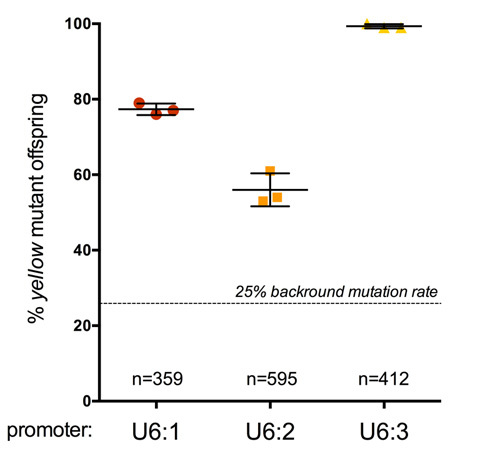 We had previously found that gRNAs targeting yellow had substantially different rates of somatic targeting when expressed from the U6-2 or U6-3 promoter (see data here). We have now systematically analysed all three U6 promoters and found that they also differ in their ability to promote the generation of germline transmittable mutations. Different U6 gRNA plasmids vary in their ability to induce inheritable CRISPR mutations. Three independent crosses for each condition with two females each. n is total number of flies counted. Females are heterozygous for endogenous yellow as well as for a yellow transgene on the second chromosome. We have generated three gRNA expression plasmids which allow expression of gRNAs under the control of each of the different U6 promoters (see plasmids here and on Addgene). We cloned a previously validated spacer sequence targeting yellow into each plasmid and integrated them into the same site (attP40) in the Drosophila genome. We then crossed these flies to our nanos-cas9 (CFD2) line and probed nos-cas9; U6 gRNA-y1 females for yellow mutations in the germline by crossing them to yellow mutant males. We found that the different U6 promoters varied substantially in their ability to direct Cas9 mediated mutagenesis of yellow. Whereas U6-3 driven gRNA-y1 gave rise to 99% yellow mutant flies, U6-1 gRNA-y1 resulted in germline transmission rates of 77% and U6-2 gRNA-y1 in 56% germline transmission. Note that 25% yellow mutant progeny represents the background rate from the yellow mutant alleles present in our cross and would be expected in the absence of CRISPR/Cas mediated gene editing.